There is so much going on right now I needed a Friday recap (for this week only) as I have no lofty goals of ripping off The Lisa‘s massive and beautifully (often sarcastically) written recaps for Bruce Clay. The Happy Webbies store is finally open for business! The store currently has four shirts (and several buttons) with major web development and standards guru faces and sayings on them. For example, Jeffrey Zeldmanâ€™s bold yellow shirt says, <you>dumbass</you>. It doesnâ€™t get better than that and I canâ€™t give enough props to the boys at nGenWorks. They continue to be one of the most innovative and talented web design and development companies in Jacksonvilleâ€¦ arguably the entire East Coast! Michael Gray is laying down the law, yet again, this time to Download Squad’s Christina Warren who took a nasty jab at the entire SEO community in her article on Google removing thousands of malware sites. I wholeheartedly agree with everything Michael had to say and continue to be floored by the negative responses of educated Internet marketers, developers and reporters who still consider all SEO’s to be one step below lawyers. Get your very own TPS Report from Initech! That’s right, now you can spread holiday cheer to your coworkers by printing and filling out your own TPS Reports from Office Space. Thanks JohnOrg for a terrific stumble that’s reduced this week’s productivity by 7 minutes and 52 seconds. Can they build it? Yes they can (and did)! After some discourse on Twitter with Tamar, she dug up the following oldie, but goodie from Gina Trapani at Lifehacker on how to create and manage multiple Firefox profiles. Why would anyone want to do this? Because all of those extensions add up! And, if you live with a less tech-savvy user they might be a little intimidated by those customizations, so besides having a sparse browser that you can check, help your spouse or roommate out as well and go mutli-profile. Go Global with Google! RedFly Marketing, Ireland’s top search engine marketing firm has released the second version of their Firefox extension, Google Global, which allows you to see both organic and paid search results as they appear in virtually every location on Earth. This is a terrific extension for search marketers and anyone running a global ad campaign online. Webmaster World’s Pubcon 2007 Search Marketing Conference in Las Vegas!!! That’s right, it’s almost here. I leave Monday afternoon and return Saturday. This will be my first Pubcon and I’m beyond excited. The keynote speaker lineup alone is a force to be reckoned with and it’ll be refreshing to see sessions that break the Search Engine Strategies mold. I’ll be covering several sessions for Loren Baker’s Search Engine Journal. The posts will be less live blogging and more analytic. If we haven’t met, yet, I’m the redhead up front with a computer that’s probably dying a slow battery-deprived life. Besides this being my first Pubcon, it will also be my first conference as a married woman. In honor of that event, Brad Cornelius, my husband will be flying out on Wednesday to meet my home-away-from-home. While I’m there two other MPS Group employees will also be there for a pharmaceutical conference, so we should be one happy Jacksonvillian family! When I’m not busy blogging and jotting down notes from the 8am until 6pm or later conference sessions, I’ll be having fun in Vegas baby. Currently on the books: Tuesday night I’m going to see Blue Man Group, Wednesday night is the SEOmoz Werewolf Game and Thursday night is the SEO Charity Poker Tournament. My husband has entered the tournament as a paying player and I’m hoping to win one of Pat Sexton’s (of SEOish and FeedTheBot fame) generously donated three free seats. 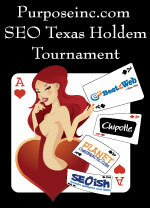 If I win, I will be sporting Bond Girl, Xenia Onatopp attire and preparing to kick some serious SEO rockstar a$$. Other notable SEO’s at the table include Dave Davis, Neil Patel, Carolyn Shelby, Brent Csutoras, TheMadHat (aka Aaron Chronister), Aussie Webmaster (aka Frank Watson) and the James Bond to my Bond Girl, David Mihm. I won’t speak to our reaction just yet, but stay tuned. How about slacker SEO, hasn’t purchased nice clothes in about five years attire? Cshel: I vote for the *killer* floor length satin gown to be worn. You better believe you can wear your floor length gown. We need all the glam we can get! By the way, if anyone tried to register yesterday and found that the tournament sold out, we added another few handfuls of seats that are now ready for people to sit in them. Please dress up as much as you like. The Venetian always has a mix of everyone from dressed in their best to Bob and Betty in their matching shorts and Hard Rock Vegas T-shirts! Wish I knew about the no hold sooner. I would be there in a heartbeat.